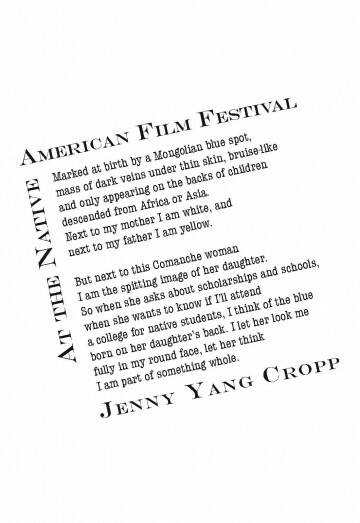 Jenny Yang Cropp is the author of one chapbook, Hanging the Moon (RockSaw Press). Her poems have appeared in Boxcar Poetry Review, Ecotone, Hayden’s Ferry Review, and other journals. She grew up mainly in Oklahoma, received her M.F.A in creative writing from Minnesota State University-Mankato, and is currently a Ph.D. candidate in English at the University of South Dakota. This poem is divided in two, like its speaker. First there are the things that don’t fit, her peculiar marks of otherness. What follows, though, isn’t a simple discovery of belonging – it’s the illusion of belonging in which the speaker eagerly participates. The ache of it is palpable in the abrupt change in tone; matter-of-fact acceptance is quickly replaced by the wishful idea of being “her daughter.” In fact, the idea of being the Comanche woman’s child overtakes the speaker so fully that she says, “I think of the blue/ born on her daughter’s back” instead of “on [my] back.” It makes the last line – “I am part of something whole” – ring a little hollow, revealing the longing that coexists with acceptance. American Typewriter is uniformly heavy with lots of squiggle in its lowercase g, curvy lower f, t, a… like a “mass of dark veins… bruise-like” on the page. Engravers Gothic provides the title with a marquee quality, announcing what’s playing at the film fest. Together with the poet’s name it forms three sides of a box, tilted, since the speaker is between worlds and not likely to fit into any single place.